Sussex’s Chris Jordan got off to a winning start in the Big Bash League in Australia with the Sydney Thunder on Sunday with a victory over his former club, the Adelaide Strikers. 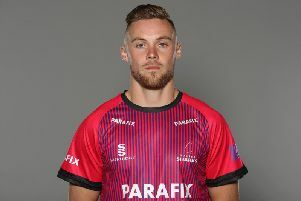 Jordan, who took 1-23 against Jason Gillespie and Rashid Khan’s Strikers, joined the Thunder as an international replacement along with New Zealand international Anton Devcich, the duo taking the places of England’s Joe Root and Jos Buttler, who head out to the Caribbean to take on the West Indies. The New South Wales side comfortably beat the Strikers by 71 runs, which included a majestic 68 off 40 balls from Australia’s Shane Watson, which helped them to a total of 168-6. Jofra Archer’s Hobart Hurricanes continued to impress with an another win against the Melbourne Stars on Monday. The Hurricanes travelled to the Melbourne Cricket Ground and demolished the Stars by 59 runs, with Archer taking 2-23 off 3.1 overs. The 23-year-old has now taken nine wickets in the tournament. Australia’s D’Arcy Short top-scored with an unbeaten 96 off 57 balls, setting a target of 185-2. Archer's Tasmanian side sit top of the table, on 12 points, four points clear of the chasing pack with a game in hand. It was a mixed week for the Strikers with a 41-run victory against Melbourne Stars on Friday, but the heavy defeat against the Thunder has set them back, though they are still in the play-off positions after eight games. Colin Ingram top-scored for the Strikers with 57 off 41 balls, setting a target of 178-5. Khan took 1-18 from his four overs. The 20-year-old is the joint leading wicket taker in the BBL this season. Jordan’s Thunder travel to the Brisbane Heat on Thursday, and the leaders, the Hurricanes, travel to the Perth Scorchers on Friday.